Travellers between New York and Grenada will have the option to chose from 5 non-stop flights per week, starting in January 2017. JetBlue Airways is increasing its flight frequency to 5 times a week from the current 4 times weekly. Effective 9 January 2017, JetBlue is adding a Monday flight to its weekly service on Tuesdays, Thursdays, Saturdays and Sundays. This Monday service will continue until 30 January, and resume on 13 February 2017, continuously. Chairman of the Grenada Tourism Authority (GTA), Mr Rodney George, in welcoming the decision of JetBlue to add an additional flight stated, “New York is the US state that contributes the largest amount of visitors to Grenada. Last year, 19,000 stay-over arrivals were from New York with the absence of JetBlue for the first 5 months. Between January and July 2016, we’ve seen a 19% increase in arrivals from New York largely due to the presence of JetBlue’s 4–day weekly flights.” He further stated that JetBlue has once again demonstrated confidence in Grenada as a tourism destination and that the GTA looks forward to further strengthening this relationship. 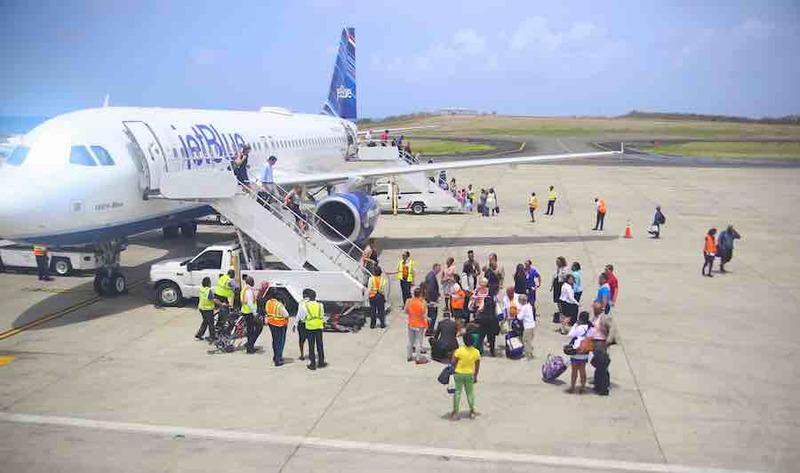 JetBlue Airways began its flight service to Grenada from JFK airport on 14 June 2015 with 2 flights per week, and increased to 3 flights per week on 15 September 2015. Added to its current 4–day weekly service, in July, the airline announced the addition of its premium Mint service to Grenada starting 21 January 2017.